UPDATE 3/21/17: Pulte will begin selling Circle Mountain homes Saturday, March 25, Pulte sales rep Carlin Hannosh said today. The sales will occur at a model home in the La Solana neighborhood at the northeast corner of North Valley Parkway and Dove Valley Road [map]. “We will have a limited amount of homesites released for the weekend,” Hannosh said. Pulte has framed up the first houses in the Circle Mountain section of Anthem after storms delayed the planned opening of model homes. The wet winter caused “up to five weeks delay in construction progress” during construction of road beds, which require “long drying times,” said Phil Turner, vice president of land for Pulte. Circle Mountain, west of I-17 and north of the Daisy Mountain Post Office on 43rd Avenue, is the last planned neighborhood for Anthem. Model home construction had been expected to start in January, with the first models slated for opening in mid-April. The target’s been pushed back. “Models should be complete in early May and we will sell from the site shortly after that,” Turner said. “We will begin actual sales for the residential lots from another selling location where we have models (the same or similar to Anthem’s plans) in the last week of March.” He was not ready yet to say which location that would be. Pulte plans to deliver the first of 77 Circle Mountain homes to customers before the end of the year, Turner said. Lennar, which has 125 lots in Circle Mountain, has also started construction after a rain delay, said Lennar spokesperson Martha Moyer Wagoner. “At this time, the best estimate for a grand opening is perhaps June,” Wagoner said via email. One of the view lots, looking west, prepped for construction. Where the stuff you never see will go. 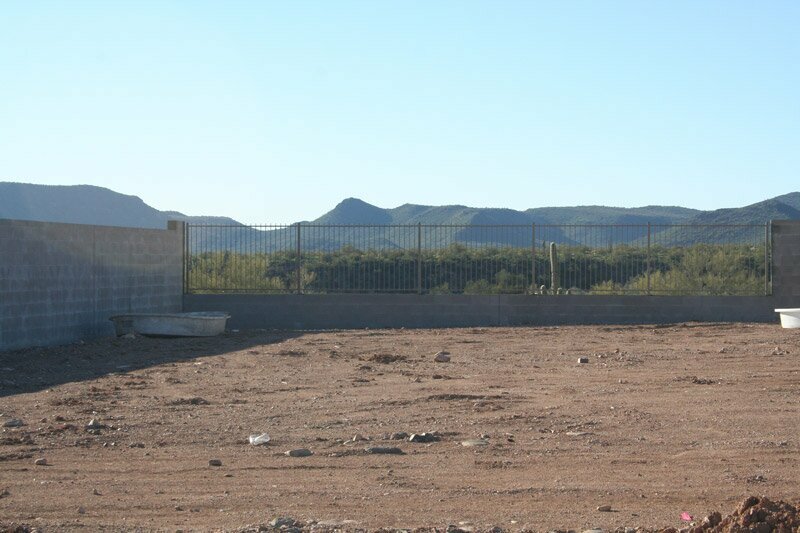 That’s Daisy Mountain in the background, just beyond I-17 (hidden by the block wall). A single-story Pulte model home with a two-story model behind it. Gavilan Peak is among the sights visible from Anthem Circle Mountain. — Karen Goveia contributed to this report.